Streets connect communities and people. The best streets have little or no traffic, noise or pollution and support residents with easily accessible parks, schools, playgrounds and businesses. For the last half-century, we have been building wide, noisy streets that cut through towns, discourage street life and reduce mobility for non-drivers. NJFIT supports street designs that reflect and keep up the community. This street in downtown New Brunswick, NJ (left) is clearly designed to meet the needs and character of the city, while this stretch of road in Rochelle Park, NJ (right) looks and feels like a generic, automobile-centered highway. Communities should be involved in the transportation planning and design process early, by positively crafting and refining their vision for the future, and then determining what transportation infrastructure is necessary. Transportation professionals play an important role in helping communities define and implement their vision. By providing technical assistance and listening to the community's concerns and objectives, transportation professionals can help communities understand their vision and satisfy both the transportation designers and the stakeholders. In planning and designing its Town Center, the community of Washington Township, NJ invited all stakeholders to participate and contribute their ideas. 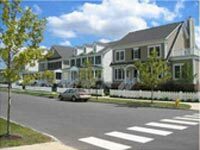 With the help of the New Jersey Department of Transportation (NJDOT) and other state agencies, the community was able to decide on a vision for a mid-density, mixed use pedestrian-friendly town center, while preserving open space at the edge. Early numbers seem to indicate that Washington Township has built a vibrant pedestrian-scale downtown surrounded by parkland, as well as a strong tax base. When communities are able to define their own transportation needs they usually want safer streets, as well as amenities necessary for non-car transportation, such as sidewalks, bike lanes and curb ramps. Studies have shown that these types of streets are the safest for drivers and pedestrians alike. "Streets are the river of life." Community-oriented street design benefits all residents by accommodating drivers and pedestrians of all ages and needs. This means safer routes for school children and designs acceptable for senior citizens. It also means street designs that support environmental justice and ensure that transportation projects do not negatively impact minority or low-income populations. 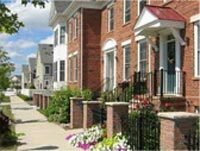 A 1999 study by the Urban Land Institute of four new pedestrian-friendly communities determined that homebuyers were willing to pay a $20,000 premium for homes in these locations rather than similar houses in surrounding areas. Streets for Communities FITness goal is listed below in the drop down boxes. Achieving this goal is possible through the application of various tools and programs.